LED corn lamps can be used in multiple different fittings from table lamps and ceiling lights to floor lamps and wall sconces. These energy efficient light bulbs provide a great amount of light using a 360 degree beam spread for all directions to benefit. Bathrooms and kitchens are usually the main rooms for where the LED corn lamp can be found; this is because these rooms often require clear, cool and natural bright lights instead of warming yellowy glows. If you are growing tired of dim and dull lights then our LED corn lamps can deliver you a bright solution. These LED corn bulbs instantly have an impact on the feel and brightness of the room. This will leave you seeing much clearer and room feeling rejuvenated with new light. More and more people are looking for fresh ways to save energy without compromising the quality of light. With this need, the popularity of LED corn lights are most definitely growing, and now you can buy your own from our online store! Direct Trade Supplies puts a lot of energy into supplying the best LED lighting to hit the market. Whether it’s E27, B22 or in the corn bulbs case E40 light bulbs, we strive to deliver the best LED models available. Our LED corn cob lamps are compatible with almost every standard lighting receptacles, using a screw base for ease of installation and replacement of conventional CFL lamps. Once installed these 150w corn lamps will provide the user with 50,000 hours of light, making this model a ‘fit and forget’ piece that requires little to no maintenance once applied. If you are looking for mood lighting then the LED corn bulbs are certainly not advised, instead of providing a calming atmosphere these LEDs are all about the brightness. We have two popular models, both E40 bulb types but one has a cover whereas the other doesn’t. Whether you want a corn cob lamp cover or not, both of these models will prove to be an effective purchase if you’re looking for energy saving lights. And because they use LED bulbs you don’t have to worry about the lamps heating up! Safe in the knowledge that they’ll perform fine against home artwork, photographs and other sentimental or valuable objects. The name corn lamp has been inspired by the shape and design of corn on the cobs. The small individual yellow LED lights replicate the corn pieces with the general size and shape of the bulb reflecting the entire cob. If this tasty LED light has impressed you then please feel free to call our friendly customer service team or drop us an email if you’d like to discuss more or make an order. 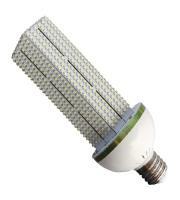 LED lighting is the future and the LED corn lamp is one of the models spearheading the way.